A rally outside the White House Friday offered a clear example of the Muslim Brotherhood's "Grand Deception" in action in America. To a casual observer, it appeared that a few dozen people came out to support ousted Egyptian President Mohamed Morsi. Protesters shouted his name and spoke passionately about democracy and how they think it was violated in Cairo. 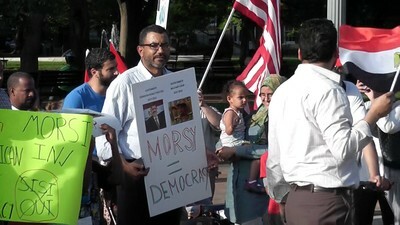 Signs like "We love Morsi" and "Egyptian Americans Support Democracy" made it seem Morsi was a beloved and unifying figure. In Egypt, opposition to his rule triggered massive street demonstrations considered among the largest in history. Nobody at the White House rally mentioned the Muslim Brotherhood, from which Morsi emerged a year ago to become president. No one referred to Morsi's attempts to monopolize power for the Brotherhood via edicts and appointments – moves that fueled widespread discontent and drove millions of protesters to the streets of Egypt. But an examination of the rally's organizers and speakers shows deep connections to the Brotherhood, an 80-year-old religious and political movement that seeks to establish a global Islamic Caliphate governed by Shari'ah, or Islamic law. Its motto: "Allah is our goal, the Quran is our Constitution, the Prophet is our leader, struggle [jihad] is our way, and death in the service of God is the loftiest of our wishes." The July 5 rally was organized by the Dar al-Hijrah Islamic Center of Falls Church, Va. mosque that has been home to some notable Islamic extremists. Law enforcement records obtained by the Investigative Project on Terrorism in 2010 show it has served as "a front for Hamas operatives in U.S.," and "has been linked to numerous individuals linked to terrorism financing." It was home to the late American-born terrorist Anwar al-Awlaki before he left the United States. 9/11 hijackers Nawaf al-Hazmi and Hani Hanjour attended the mosque, as well as Fort Hood shooter Nidal Hasan. MAS and Dar al-Hijrah have shared several leaders. For example, former MAS President Esam Omeish served on the mosque's board of directors. Omeish had to resign from a Virginia immigration board in 2007 after he was seen on videotape praising Palestinians who chose "the jihad way" to liberation. And Imam Shaker Elsayed is a former MAS secretary-general. In a 2004 profile of the Muslim Brotherhood in America, Elsayed praised Muslim Brotherhood founder Hassan Al-Banna, saying that his ideas are "the closest reflection of how Islam should be in this life." Earlier this year, Elsayed told an Ethiopian group that Muslim men should be "the first in jihad line." At the White House rally, the former director of the MAS political arm, Mahdi Bray, spoke first amid chants of "Democracy!" and "[in Arabic] Wake up Al-Sisi, Morsi is President!" "We will join our voices, we will join them together, we will join them together as Muslims, Christians, Jews, secular, wherever there are people, wherever people care about democracy and justice, we'll raise our voices together," Bray said. Bray has repeatedly defended alleged terrorists and, during a previous rally near the White House, proudly raised his hands in support of both Hamas and Hizballah. Joining Bray at the pro-Morsi rally was Mauri Saalakhan, an anti-Semitic conspiracy theorist who has defended former Iranian President Mahmoud Ahmadinejad, and blames Israel and its supporters for a host of global problems. Like Bray, his message seemed benign. "We don't want to see more bloodshed in Egypt," Saalakhan said. "We don't want to see more hardship in the way of how we are viewed in this country and around the world as a result of our wrongheaded policies in that part of the world." What Saalakhan left out was that he views Hamas as a "resistance organization – whose armed resistance is legitimized by clearly established international law!" He previously appeared on Iranian television to say that Nidal Hasan's shooting massacre at Fort Hood was "not an act of terrorism, it was an act of war on the soldiers of a military installation." Given the organizers' connections and the speakers' histories, the July 5 rally appears to be more about rallying to defend the Muslim Brotherhood than about any high-minded rhetoric about democracy. Islamists must believe they can't persuade Americans with a direct appeal, so they continue with their Grand Deception and hope no one will notice. Frank Spano serves as the Director of National Security Policy for The Investigative Project on Terrorism. Yes, you are so right. This is all smoke and mirrors. I am encouraged by their setback, and by the egg all over Obama's face.